I have done a number of projects for Emily (you may remember her yellow dress), and this was definitely one of my favorites! 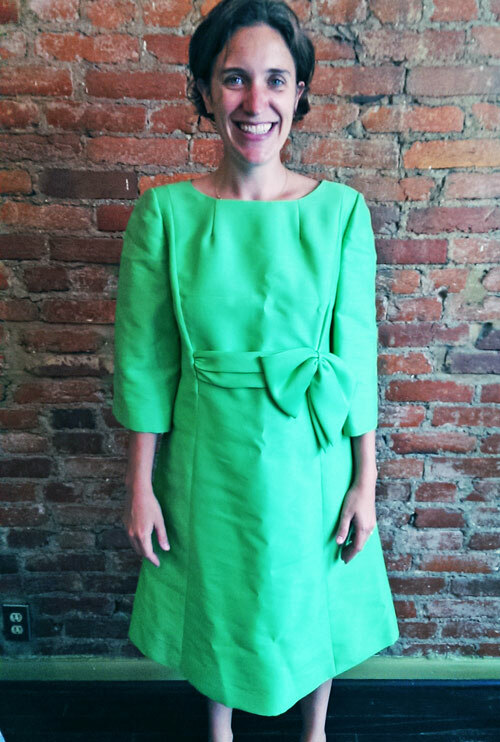 She found this amazing vintage piece and saw the potential it had! As you can tell, the dress was just too much, and it was taking over her body! The sleeves were crazy, the hem was too long, it was too big, and it had a few moth holes. Check out that unflattering dress!! I kicked things off by fitting the back seams from top to bottom, removing some, but not all, of the flare. 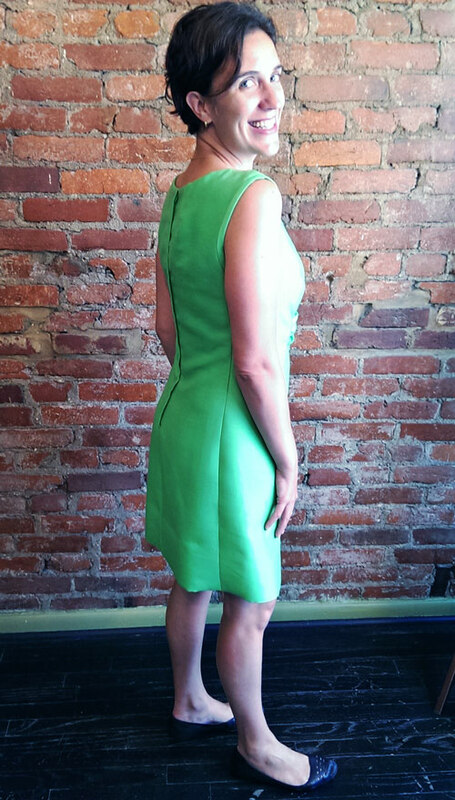 I also ditched the sleeves and then met for a second fitting. At this point we were able to tell that the darts on the front of the neck needed to be extended, and the chest needed a bit of reshaping. I also added darts to the back of the neck to make it lay nicer. Emily wanted to keep the armhole as wide as possible at the top of the shoulders, so I decided to make piping out of the old sleeves to finish off the armholes. I also stabilized a few of the moth holes, and then finished it all off with a good ol’ hemming ABOVE the knee. Look! you can now see that there is a body inside that dress! 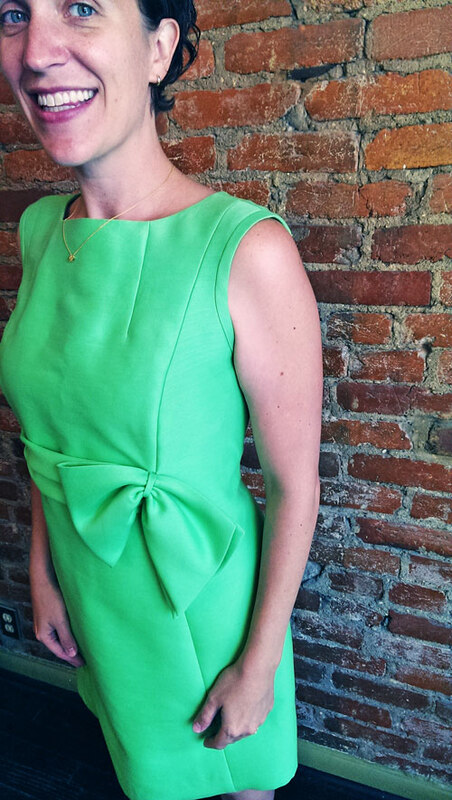 Do you have an amazing vintage piece that needs some modernizing? Worry not, I can make sure they stay timeless classics if you wish–just maybe a timeless classic that fits your body and style. 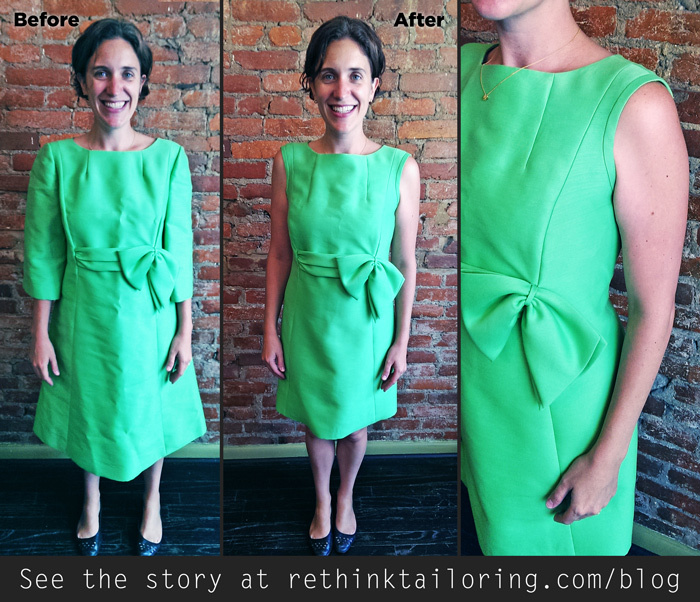 Email me about your project at kristen@rethinktailoring.com. I look forward to it!